First group was transferred to the Haim Arlosoroff (No. 133) when the engines broke down. After repairs in Italy, a new group was embarked. 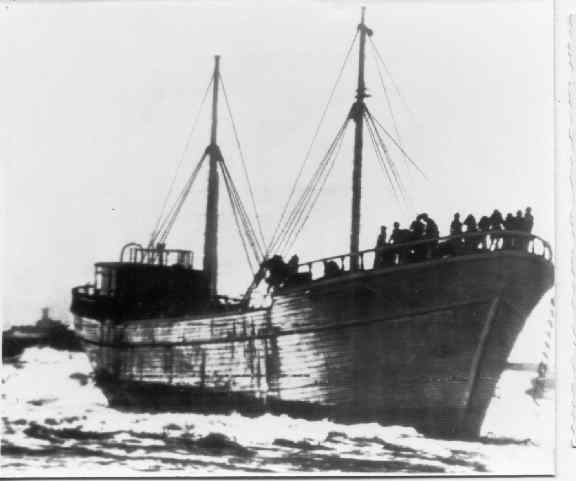 The ship was beached north of Gaza, undetected, and most of the passengers escaped the British Army cordon. Hundreds of local residents came down to the beach to mingle with the refugees who were able to evade arrest. Many residents were arrested and sent to Cyprus; some 460 local residents were returned home during the next week. Abandoned wrecked ship burned by Arabs. Name: Named after a resident of Atarot, near Jerusalem, head of a Committee to Aid Immigrants, killed a short time earlier in Italy.